The humble mutlicolored 3” x 5” index card is a ubiquitous sight in production offices and writer’s rooms of all stripes. The image of a writer meticulously organizing a huge array of index cards on a cork board is a universal one. With Celtx, we’ve made the cork board digital. You can retain the analogue functionality of index cards while cutting back on production costs by not having to buy thumbtacks. Also, we have way more colors. A great way to begin a project is to lay down the basics of each of these points on an index card and arrange them sequentially to see how your story flows. From there, you can add more index cards and content to flesh out each component of your story. Color-coding is up to you, there are no hard and fast rules. For example, you can choose a color to correspond to scene by tone or action. That way, you can look at your index cards and at a glance determine how much of your story is composed of, say, fight scenes, and how much is composed of intimate dialogue. Index cards are also applicable to more conceptual aspects of your story planning. You can use them to plot out your characters, their backstories, and their emotional arcs. You can use them to map out the physical geography of your story – which scenes take place where? Planning your story is easy with Celtx Index Cards! If you’re writing an episodic project, you can color-code by episode and map out the grander scheme of your story. Have a great idea for a snappy line of dialogue or a killer action sequence? Jot it down on your idea cards. Trying to workout a complicated scene? Plot it out with some brainstorming cards. In Celtx, you can have as many independent sets of index cards within your Studio as you can handle. The only limit is how in-depth you wish to go. There are also applications for branded content. If you need certain pieces of imagery or copy to appear in the project, plot them as beats and build your script around it. Additionally, the easy to digest and highly visual nature of index cards make them an ideal presentation tool for pitch sessions and workshops with your clients. 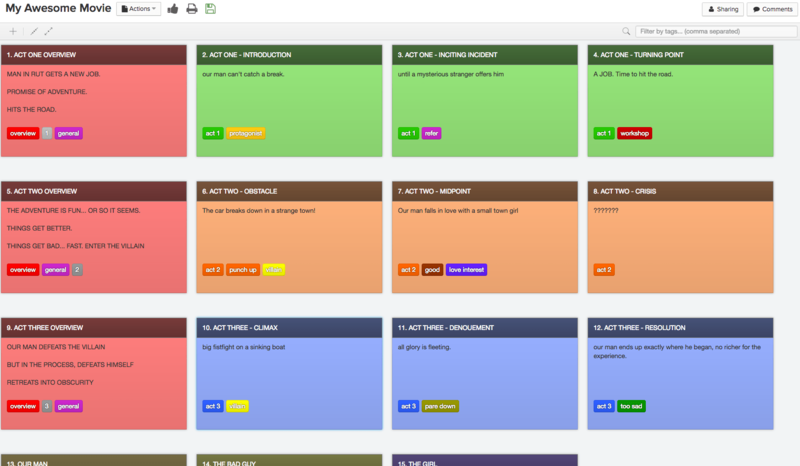 Best of all, since Celtx’s index cards are automatically numbered, when you feel confident in the plot you’ve created you can automatically convert your cards into a script and instantly get writing on the finished product. If this has got you thinking about planning your next project in Celtx, the first step is easy: sign up for a free Studio trial with all of our planning tools included.